My first recollection of these Coleco portables takes me all the way back to my cousin Tim's house in the summer of 1981. He had received Pac-Man for his birthday, which was a pretty nice present considering they cost about $60 back then. At the time I thought that was a monumental amount of money to spend on a single game, but it turned out to be money well spent. We played that little machine constantly one summer, and could never seem to get enough of it. The fact that we could play it anywhere and at any time was a huge plus. Whenever we had a break, you could always hear Pac-Man's annoying sound effects emanating throughout the house. The air conditioner always going full blast in the living room, and after shooting some hoops on a hot summer day we would bask in the cool air while passing Pac-Man back and forth. Its only drawback was the fact that it ran on four "C" cell batteries, and after playing a few games, Tim would wisely insist that we give it a rest to conserve the batteries. If they ran out, there was no telling how long it would be out of commission until my aunt bought fresh ones. There's something about these little Coleco hand-held arcade games that video game enthusiasts find very appealing. There are five games in the set, and all are huge names in video game history: Pac-Man, Ms. Pac-Man, Galaxian, Frogger, and Donkey Kong. Their cabinets were designed to make them look like miniature arcade machines at a time when arcades were at the height of their popularity. Not only did they look cool, but the top part did a great job of minimizing the glare. Surprisingly, these little games also provide reasonable adaptations of the original arcade hits. Sure, the animation is choppy and the gameplay is simplified a bit, but the fun factor is way up there. The Vacuum Fluorescent Displays (VFD) look sharp, and the tiny controls are responsive enough. On the downside, the sound effects can get annoying, and there is no volume control. 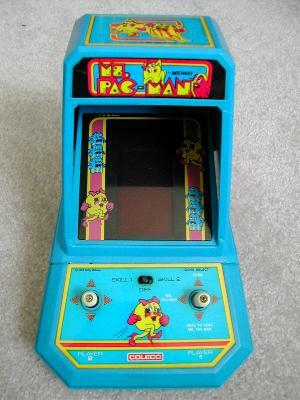 Although mainly a console game collector, I could not resist the urge to obtain a Coleco Pac-Man game for myself. It's a piece of video game history for Pete's sake! Of course, once I bought a nice Pac-Man off Ebay, it was inevitable that I would eventually complete the set. All of these games have held up well over time and are still a heck of a lot of fun to play. I highly recommend the special AC adapter which allows you to play the games without batteries. Now that I own (and cherish) all five games in the series, here are my reviews of them. NOTES: These games are graded against each other on a curve for comparison's sake. My apologies about the poor quality of the screen shots. It's hard to take clear pictures of those tiny screens. This is the one that started it all. 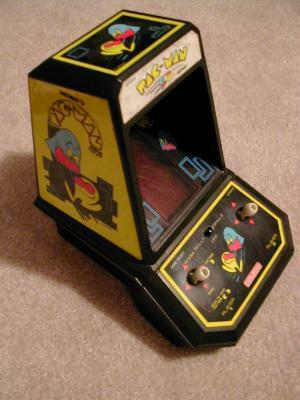 Pac-Man has that distinctive black and yellow cabinet with decals to match the arcade game. It's commendable how Coleco managed to fit the Pac-Man maze on such a small screen, complete with the "secret passages" on each side. Even more striking is how similar this plays to the arcade game. The ghosts are fiercely competitive even on skill level 1. The images of Pac-Man have alternating open and closed mouths, so when you move him around the maze he appears to be eating. The ghosts require a bit more imagination to make out. They're the right shape, but have two dots and a Pac-Man image embedded inside of them. The screen colors are primarily red and yellow, with the maze being red. Why didn't they use blue so it would look more like the arcade? Other differences include a lack of fruit bonuses and ghost values that run from 100 to 800 points instead of 200 to 1600. The high score is retained in memory until you turn the unit off, and it's displayed between games. 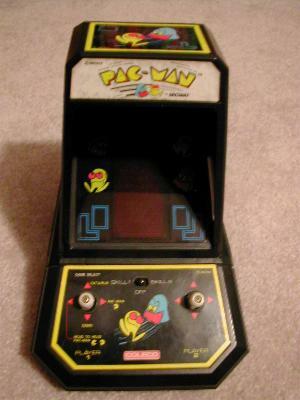 There are two skill levels and three game variations: normal Pac-Man, Eat & Run, and Head To Head Pac-Man. Eat & Run is pretty lame, but Head To Head Pac-Man is a blast. 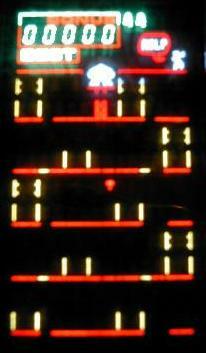 Two players compete at the same time, and the game keeps track of the difference in scores, with an arrow pointing to the player who's ahead. It's a nifty idea that I've never seen in any other Pac-Man game. The only problem is that both players need to crowd the machine to see the screen and work the tiny joysticks, which can be uncomfortable with two straight guys playing. Another issue is the game's incessant, whiney sound effects. You can't adjust the volume or turn them off, and they really do get on your nerves after a while. At least the little jingles that play at the beginning and end of each game sound nice. Finally, I wish you didn't have to use the left joystick in the one-player game. Still, this Pac-Man game is a classic that set the bar high for the other games in the series. 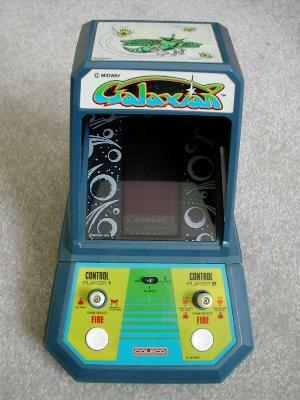 Despite being a huge fan of the Galaxian arcade game, this hard-to-find portable version didn't impress me much. Galaxian is a classic shooter featuring bug-like aliens that appear in formation and swoop down at your cannon. The alien animation is reasonable, but the blinking bombs are hard to see coming. Boss aliens appear on the top row, but when they leave the formation they look just like the other aliens, and they aren't even accompanied by escorts. 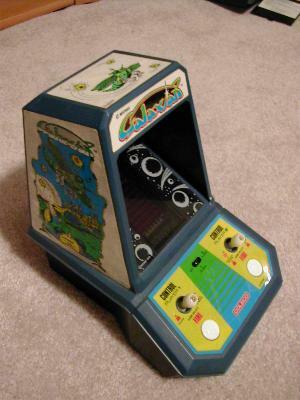 Galaxian's single skill level is too easy, and you'll polish off the first few waves with little difficulty. Since the aliens are big and the screen is narrow, they're almost hard to miss! 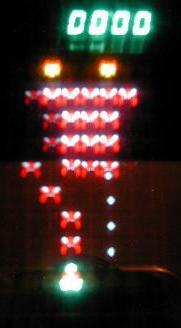 One interesting variation is the "Midway's Attackers" mode, which is basically Space Invaders with Galaxian graphics (with a boss at the top acting as the mother ship). A Head To Head mode is also included, but it's a complete bust. Player two moves his cannon across the top of the screen and both players can shoot at each other. It's hard to tell what's going on and I didn't find it to be the least bit fun. Galaxian's sound effects include screeching alien dive-bombers and an interesting explosion effect at the end of each wave. The game's dark blue cabinet features two fire buttons and two joysticks. In my opinion, this was probably the weakest entry in the Coleco hand-held arcade series. This was a major step up from Pac-Man, with changing mazes, improved sound effects, and even wandering fruit bonuses. Ms. Pac-Man's maze changes are subtle but definitely make the game more fun and less repetitive. 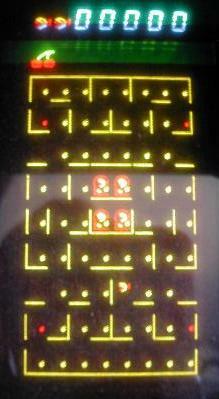 The wandering "fruit" bonus is signified by a blinking dot moving around the screen, with a "close-up" picture of the fruit shown above the maze. Sound cues indicate when the fruit appears or has been consumed, and since they sound similar to the "death" sound effect, these can be disconcerting at times. 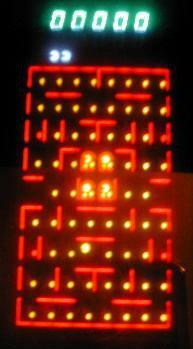 Unlike Pac-Man, the maze is yellow in color and the right joystick is used to play the one-player game (thank you!). Ms. Pac-Man herself is quite detailed. In addition to her tiny red bow, she has a nice pair of big red lips as well! The music is noticeably improved, and the droning background noise is far more tolerable than the first Pac-Man. 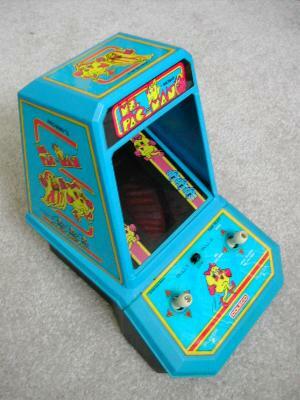 Ms. Pac-Man features two skill levels and a Head To Head mode. Apparently Coleco learned some lessons the first time around, and put them to good use is this terrific sequel. 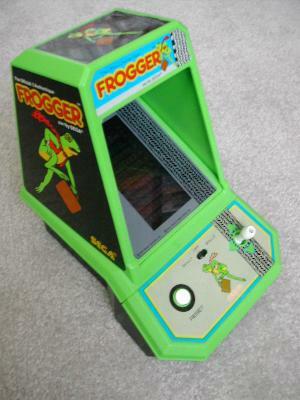 If one arcade game was perfectly suited for the Coleco portable series, it was Frogger. Since the main character hops around, smooth animation is not required, so Coleco's tiny display works great. Like the arcade, your goal is to first cross a busy highway and then navigate a stream full of logs and turtles. Your frog is displayed as a huge head with a miniscule body. It looks odd at first, but it does allow the frog to have facial expressions. All of the box-like vehicles on the road look like vans. The turtles and logs look terrific, and a snake winds his way around the median strip between the road and stream. 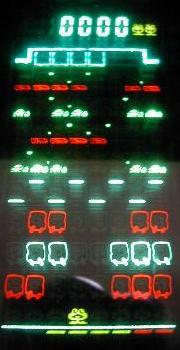 Frogger's attractive display boasts more colors than the other games in the series. It plays almost exactly like the arcade game, and is easily the most addictive of all the Coleco portables. Frogger is also quieter than the other games. A pleasant melody plays at the start a new game, but thankfully there's no droning background music during the game. Two skill levels are included, but there's no two-player mode. The control panel includes one joystick and a reset button, and the green and black cabinet is very attractive. 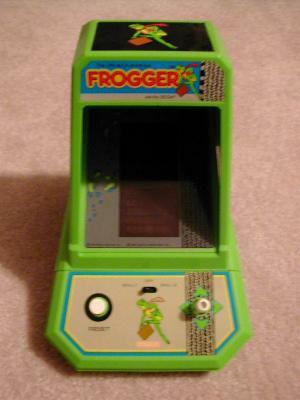 If you collect portable games, Coleco Frogger is a real prize. Donkey Kong hardly seems well suited for a portable game, but Coleco just couldn't resist giving it a shot. In my opinion, this one succeeds in spite of itself. 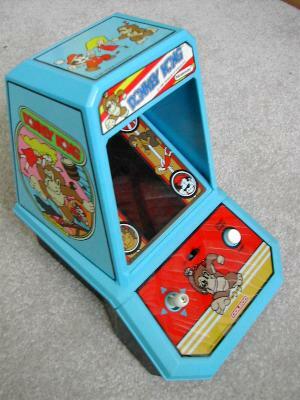 Of all the Coleco hand-held arcade games, Donkey Kong is by far the most difficult, and at times can be awfully frustrating. Just reaching the top of the platform once is a major accomplishment. Control around the ladders is tricky, and it's easy to fall off the ends of the platforms (although it's not always apparent what happened). But despite all of its issues, I found myself hitting the reset button again and again as I feverishly tried to master this game. The girder layout is red and yellow, and Donkey Kong and the princess are both purple. I like how Donkey Kong hoists barrels over his head before sending them down towards Mario. Mario is awfully small and not very detailed. He can grab the hammer, but it's just a 200-point bonus - he can't smash the barrels. The awesome intro tune is faithful to the arcade, but the abrasive background noise can get on your nerves (although it's still not as bad as Pac-Man). 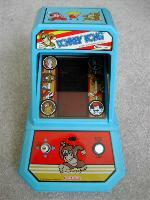 Donkey Kong is a single player game, and its light blue cabinet features the best artwork of the series. This one is easy to criticize, but once you start playing, you may find yourself hooked. In closing, I have to mention that Coleco actually produced two additional games of slightly different design, Donkey Kong Jr. and Zaxxon. These are more advanced, using dual displays and mirrors to create better visuals. If I ever get my hands on these, I'll be sure to update this page.